Peace activist Cindy Sheehan had a special vantage point for the State of the Union address Jan. 31. Rep. Lynn Woolsey (D-Calif.) had given her a ticket for a gallery seat. But she never got to hear the address. When she took off her jacket, revealing a T-shirt that said, “2,245 dead. How many more?” she was yanked out of her seat by a guard who called out, “Protester!” By the time the president was telling Congress to approve the USA Patriot Act, Sheehan was in jail. President George Bush’s speech was the opening shot in the 2006 congressional election battle. Pretending to take a bipartisan tone, Bush laid out the main issues Republicans will campaign on: terrorism, stay the course on Iraq and justify illegal wiretapping in the name of national security. Bush introduced several “initiatives” with pleasant-sounding names. All would benefit corporate profits at the expense of workers and communities. Bush used rosy words but was silent on many pressing matters — 30,000 auto worker layoffs, 48 million uninsured, a half million Louisianans still homeless after Katrina. Bush’s memorializing of Coretta Scott King sounded as empty as his commitment to civil rights, especially with new Supreme Court Justice Samuel Alito sitting in the front row, observers said. Programs to end racism and poverty were missing from Bush’s speech. Bush called the nation “addicted to oil,” an odd charge from a man widely seen as the “war for oil” president. He made no mention of oil giant ExxonMobil’s $36 billion profits last year — the largest ever recorded by a U.S. corporation, while millions of families can’t afford their heating bills. “This is lofty rhetoric, coming from an administration that utterly abandoned the poor people of New Orleans and continues to ignore not only the reconstruction needs of the Gulf Coast but the poverty crisis facing our nation,” she said. The speech is not expected to give Bush’s sagging public opinion polls much of a boost. Outside the White House at a “People’s State of the Union” and across the nation, progressive activists gathered to watch the speech and discuss a people’s agenda. 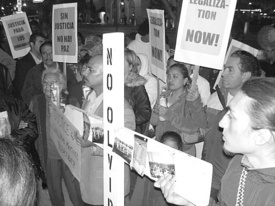 In Los Angeles, over 100 Latino immigrant rights activists held a candlelight procession to protest Bush’s immigration policies. In his speech Bush called for increased militarization of the border and a vast expansion of temporary work permits, leaving workers and families without rights. “We say no to more walls at the border and yes to permanent residence — a path to citizenship for immigrant workers who contribute to our economy and communities,” said Angela Sambrano, executive director of the Central American Resource Center-L.A. Immigrant rights is expected to come up for debate in the Senate Judiciary Committee later this month. Congress will be a major battleground on that issue and a number of others between now and November, with labor and progressive forces gearing up to break right-wing Republican control of the Senate and House. Bush called for bipartisanship, but his policy presentation was “my way or the highway” especially on Iraq, government spying and trade. Mum about his efforts to silence scientists and science teaching, he called for more science and math teachers. He tried to appropriate Democrats’ language on alternative energy initiatives, with little substance. His call for “health savings accounts” will help banks and corporations but do nothing for the health care crisis. When Bush complained that his Social Security privatization campaign had stalled last year, Democrats stood up, clapping and cheering. But his proposal for a bipartisan committee to “study entitlements” is widely seen as an attempt to undermine the coalition that thwarted privatization.